Oil on canvas, 59 ¼ x 40 ¼ in. The Museum will be awash in the vibrant hues of Abstract Expressionist Hans Hofmann in this first-ever exhibition to focus on the artist’s varied and under-appreciated public mural projects. Further information and images are available on the exhibition site - wallsofcolor.info. 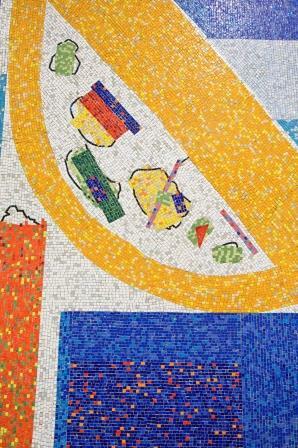 Programming for Walls of Color: The Murals of Hans Hofmann can be found here. 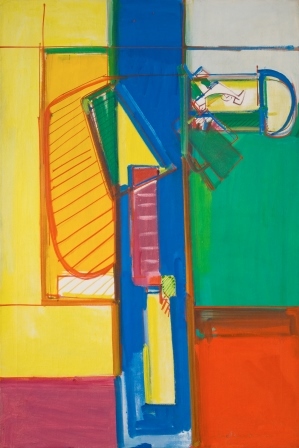 The centerpiece of Walls of Color: The Murals of Hans Hofmann will be nine oil studies by Hofmann, each seven feet tall, for the redesign of the Peruvian city of Chimbote. This was Hofmann’s extraordinary collaboration, in 1950, with Catalan architect José Luis Sert – the man who designed the Spanish Pavilion at the Paris World’s Fair in 1937, for which Picasso’s great mural Guernica was conceived. Although never realized, this visionary project was to include a huge mosaic wall – a freestanding bell tower in the town center – designed by Hofmann, which would incorporate not only his own highly evolved notions of Abstract Expressionist visual dynamics, but also forms symbolic of traditional Peruvian culture, religion and history. Studies, mosaic maquettes, photos, and ephemera – as well as studies for a mural for an unrealized New York apartment house of the same period – show not only Hofmann’s working methods, but also just how significant these murals were to the development of his art in general. Several key later paintings demonstrate the crucial influence of the mural projects on Hofmann’s final and brilliant flowering as an easel painter. A scholarly catalogue for the exhibition includes a foreword from the Renate, Hans and Maria Hofmann Trust and essays by Bruce Museum Adjunct Curator and New York University Professor of Modern Art Kenneth Silver and Mary McLeod, Professor at the Graduate School of Architecture, Planning and Preservation, Columbia University. Public programming planned for the exhibition includes the 2015 Bob and Pam Goergen Lecture Series, with lectures by Curator Kenneth E. Silver on Tuesday, May 5; Stacey Gershon, principal at Stacey Gershon Fine Art/MLG Art Advisory on Thursday, June 11; and Mary McLeod, Professor at the Graduate School of Architecture, Planning & Preservation, Columbia University, on Thursday, June 25. All lectures will be held at the Museum and will begin at 7:30 p.m.
A Guide by Cell audio tour, generously underwritten by Lucy and Nat Day, will be available for personal cell phones. Easy to follow Guide by Cell instructions will be available at the front admissions desk. The show will travel to The Patricia and Phillip Frost Art Museum at Florida International University, Miami, FL (October 10, 2015 to January 3, 2016), and to the Ackland Art Museum, University of North Carolina, Chapel Hill, NC (January 22 to April 10, 2016).